2 Trim Plates (Part #4000597) are included. 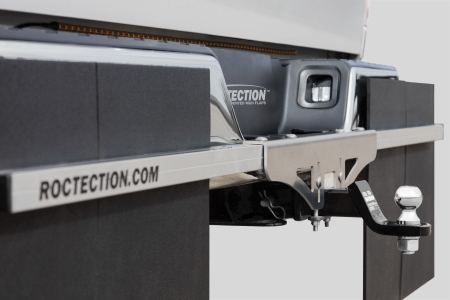 Offering a sleek style and freedom to choose the level of towing protection you desire, the three eighths inch composite rubber on ROCTECTION™ Hitch Mounted Mud Flaps can be customized exactly the way you want them. 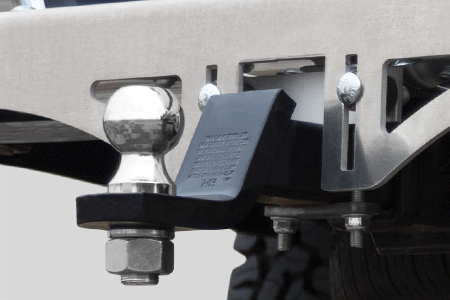 The rustproof aluminum frame with zinc plated hardware on these universal hitch mounted mud flaps fits SUVs and pickup trucks with center bumper steps and features a large stabilizer plate to minimize rocking. 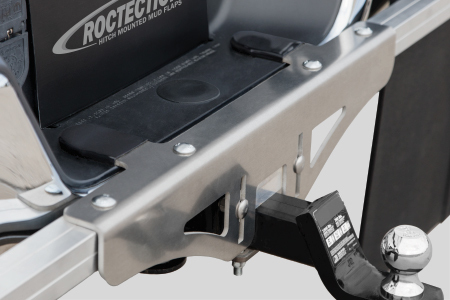 The universal ROCTECTION™ Hitch Mounted Mud Flaps are easily attached with an adjustable clamping system to the ball mount and with one pull of the receiver pin can be removed. Constructed of rustproof aluminum and zinc plated hardware. Visual access to receiver pin, safety chains and wiring with the sleek design. Prevents the mud flaps from rocking. The lightly textured yet smooth surface lessens mud and ice build-up. 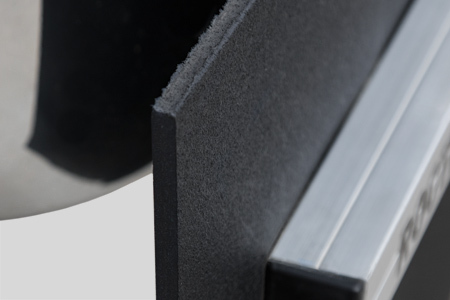 Remains flexible at -40° F and rated to resist heat up to 200° F.
Installs with an adjustable clamping system to the ball mount. Pull receiver pin for easy removal. Increase both stability and aesthetics. 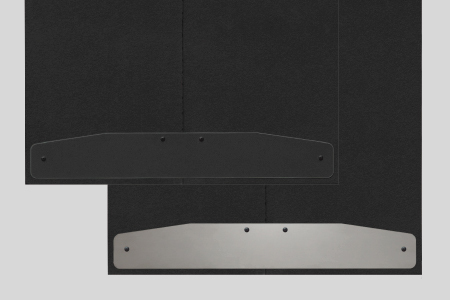 Choose textured matte black or clear coated aluminum by easily turning the plate over for your desired style. I like the Roctection due to the fact it fits my 2013 and my 2002 without any adjustments needed at all. One pin installation and it's on when I tow something and pull the pin and it's off when I'm not towing. I put a lot of work into building and painting my new smoker grill and wanted to protect it from rock chips. The assembly and install of my new Roctection mud flaps was straight forward, no problems. Now that I've been using them I've found that not only do they protect from chips but I have a lot less grill clean-up when I get to an event. It's not always how good you are, sometimes it's how good you look doing it.